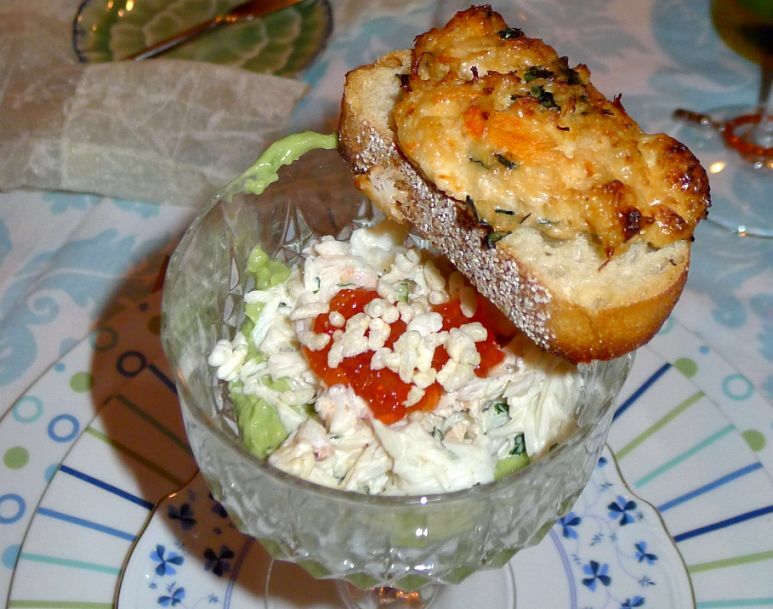 The Avocado Puree with crab in mayo is pretty fast and easy to make but make sure that your avocados are ripe and soft! 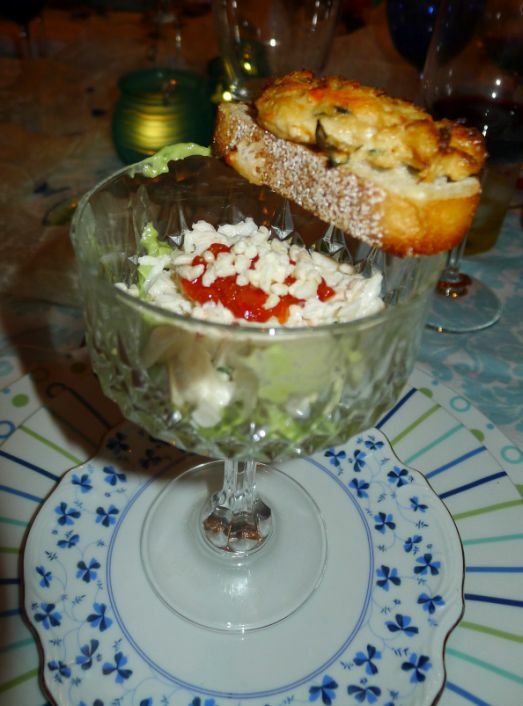 The avocado puree and the crab meat is colorful and should be served in a tall glass so that the colors of the dish can be seen. You can served it individual portion or you can serve it in a large bowl to share. 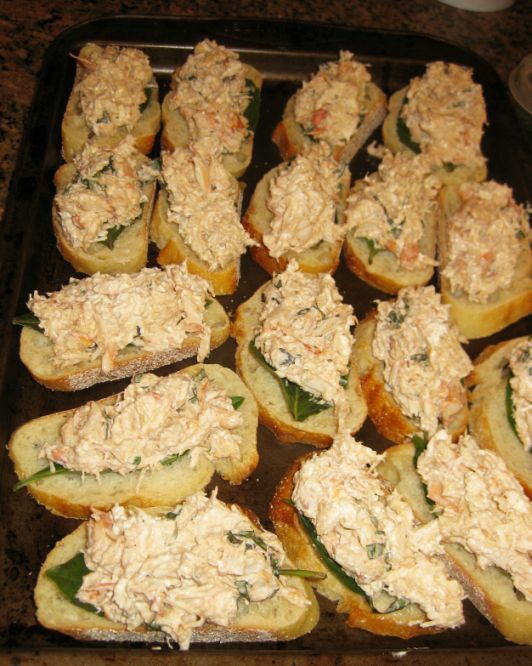 The avocados puree are quite rich so make the portion on the smaller size and don't forget you also have a piece of hot crab toast to complete the dish. 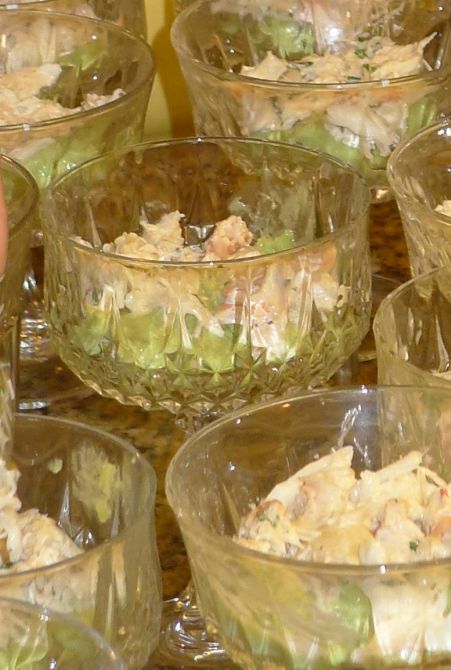 The dish has a layer of avocado puree, a layer of sweet crab in mayo, a small spoon of salmon row and I added a bit of crispy rice on top just to give it an interesting texture. 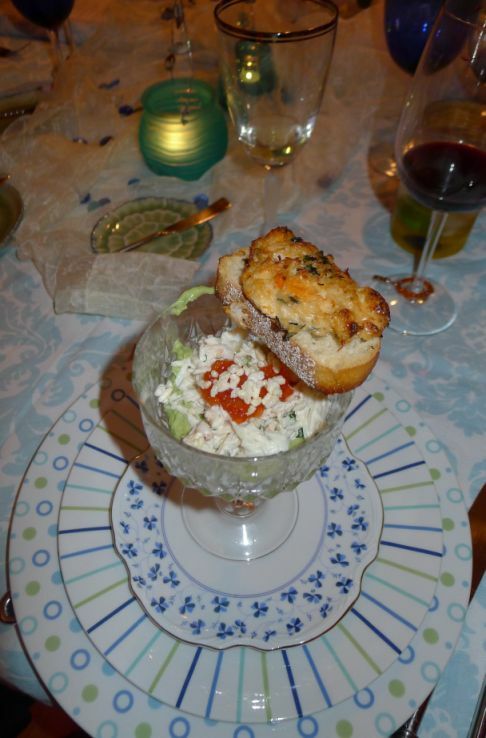 I also enjoyed the temperature contrast between the piping hot crab toast against the cold avocado puree. 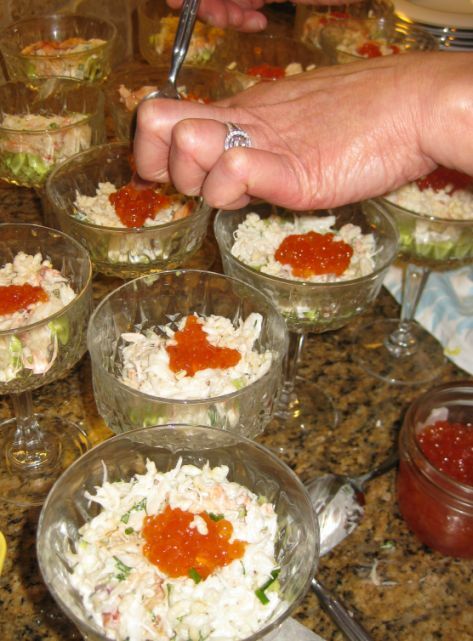 Optional for the avocado puree: salmon roe, and crispy rice. 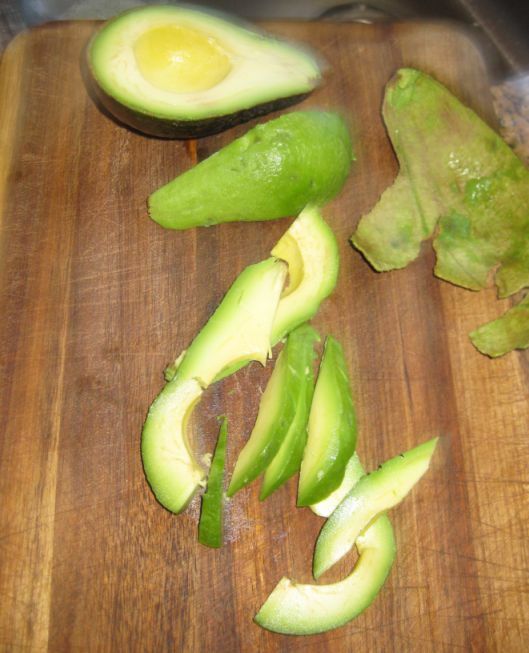 Remove the pit, and peel the avocados. 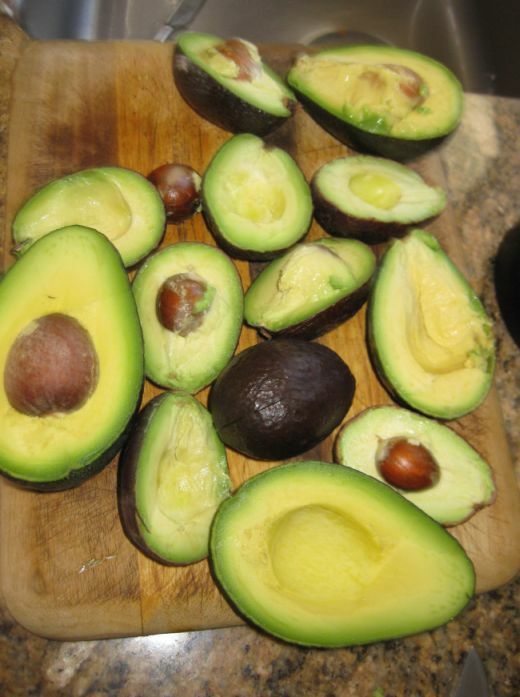 Put the avocados in a blender and whiz to a puree. 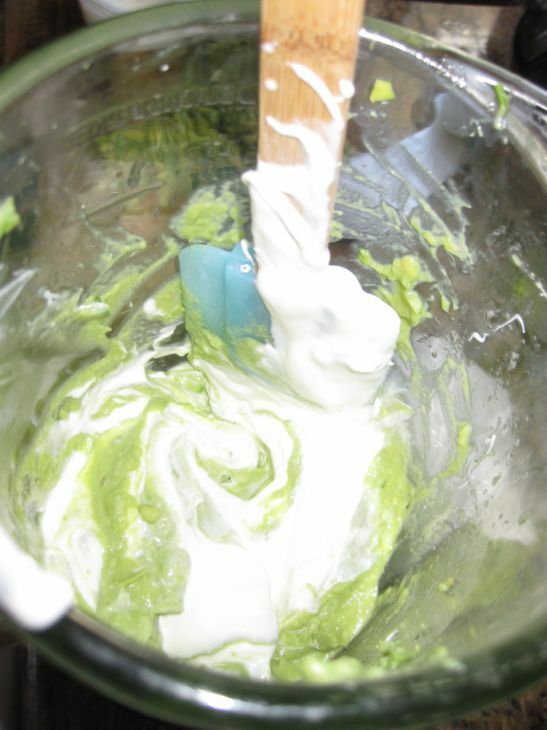 Add the crème fraiche, lime juice and mix again until combine and season with salt and pepper. Cover and refrigerate. 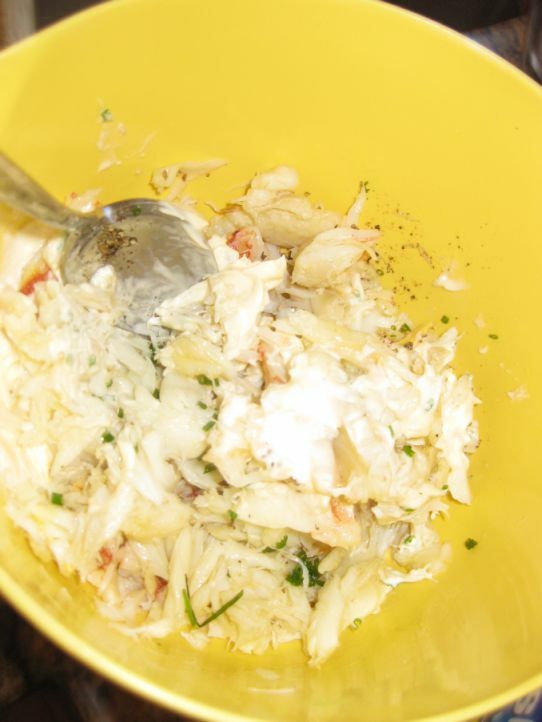 Put the crab meat in a large bowl. 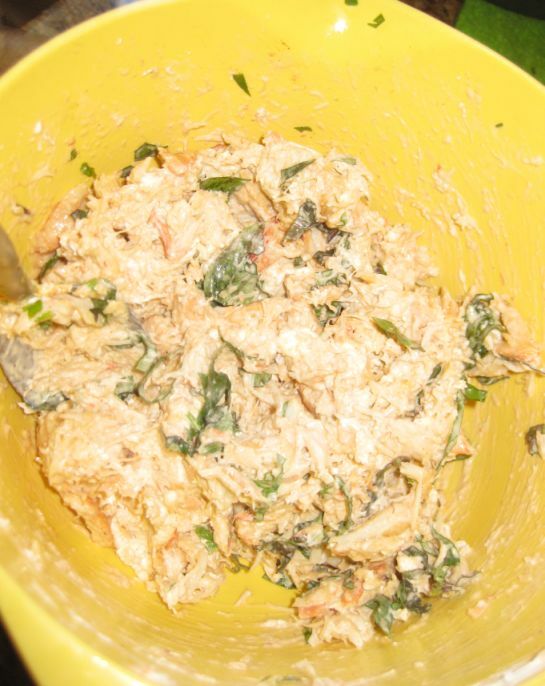 Add mayonnaise, salt, pepper, chives, shredded basil leaves. 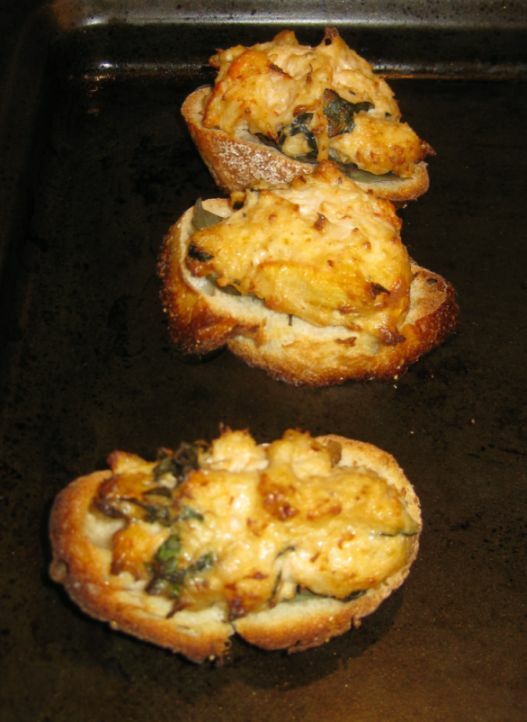 Mix gently with a fork and refrigerate until ready to use. 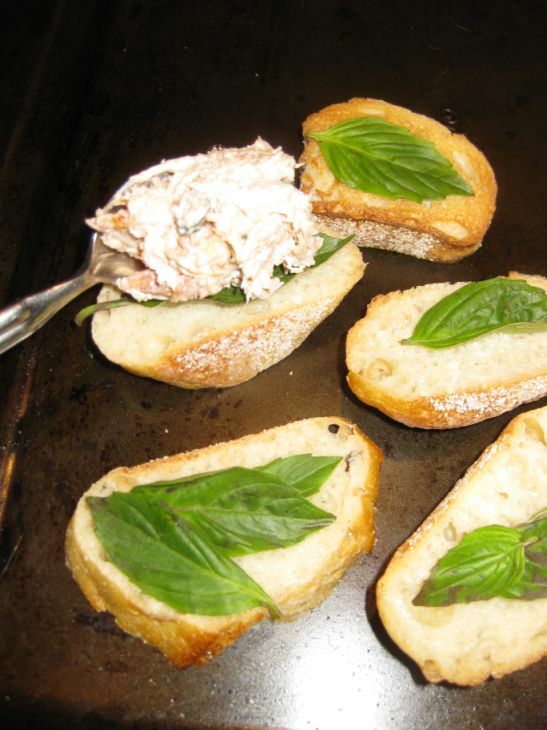 Cut the bread into thin slices and add a basil leaf of top. 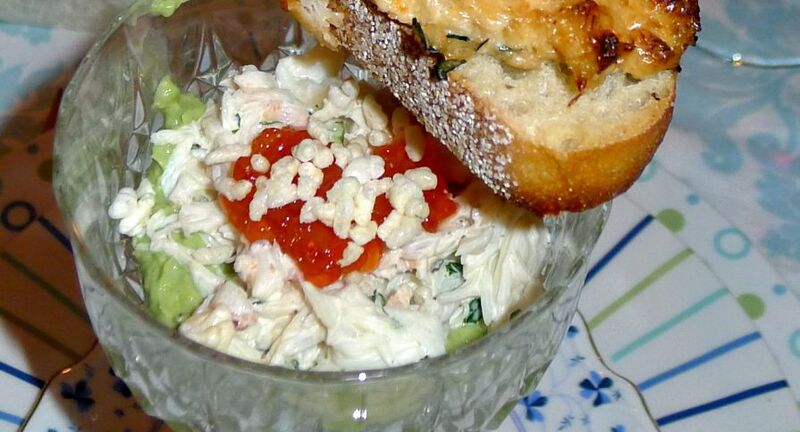 Spoon some crab meat on top of the bread. Freshly out of the oven. The bread is golden and crispy. 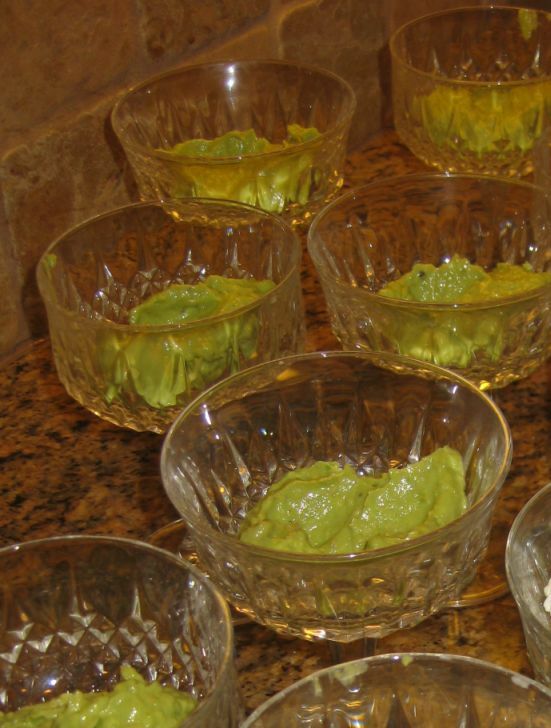 Put a generous spoon of the avocado puree on each glass. 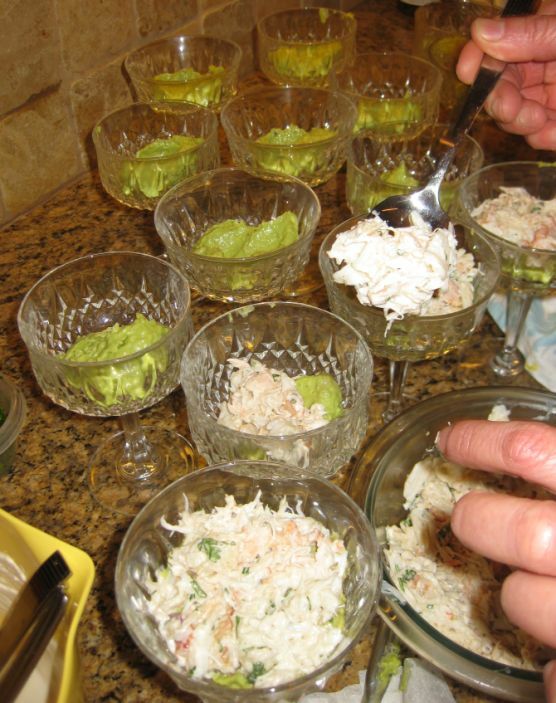 spread the crab meat on top of the avocado puree.